We've probably said this way too many times in the past, but at the risk of repeating ourselves yet again – the Gear S2 is something different. It stands out among the sea of Android Wear devices and offers a freshly reimagined experience, all courtesy of Samsung and its own vision for wearable tech. Its build number is R732XXU2BOKF but it doesn't come with an official changelog. Luckily, one senior XDA member, going by the name of supersoulfly, has really done his best and dug deep to sum up all the changes he noticed. New features and enhancements - ‘Add Widgets’ label: There’s a new ‘Add Widget’s label under the plus symbol, which makes the action easier to understand. - Auto Open Apps: When you activate this new option, apps open automatically once you stop rotating the bezel on an icon. 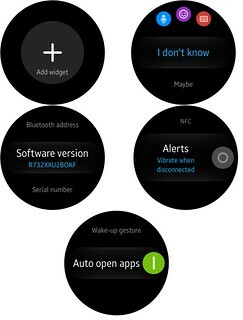 - Vibrate When Disconnected: Under the connection settings, you can use this option so that the watch vibrates as soon as it gets disconnected with your smartphone. - Screen timeout options: 15 secs, 30 secs, 1 min, or 5 minutes. - New apps: World clock, Starbucks, a navigation app (for South Korean), and Flipboard News Briefing app. - New watchfaces: Nothing new, but the same watchfaces that were showcased during the device announcement. - Notification Indicator: There’s a little orange circle that acts as a notification indicator. It appears only when notifications aren’t set to wake up the screen. - Larger Notification Text: When you double tap on a notification, the text grows bigger so you can easily read the information. Also, when you swipe up from a notification to dismiss it, a trash can symbol appears. - Notification Reply: A smiley symbol has been replaced with a simple and more traditional icon. 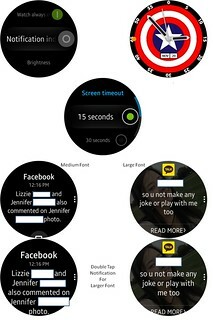 - Watch Face Template: When you scroll right from the watchface menu, you can use the ‘Add Template’ option to customise the watchface and save it as a template. Since the Gear S2 isn’t available in a lot of markets, we think that this firmware will be pre-installed on the devices where Samsung plans to release the smartwatch in the coming days. Also, the update might soon be released to the Gear S2 units in markets where the wearable is already available.